Ecuador will go into the france match with the goal difference of 0, as they have scored 3 goals and conceded three with three points on the table they must win this game to keep their hopes of qualifying to next round in their own hands. Switzerland’s goal difference is -2 and they have three points as well, leaving them to must win against Honduras and hope Ecuador lose against France. This is a big one for the south american side Ecuador who has a good chance or making it through to the next round if they managed to beat France. Three points in this game will surely book their place in the knockouts regardless of the results in other Group E match. France has already book their place in next round and they are likely to go through as group winners with a superior goal difference even if they lost against ecudor (by not more than 2 goals). 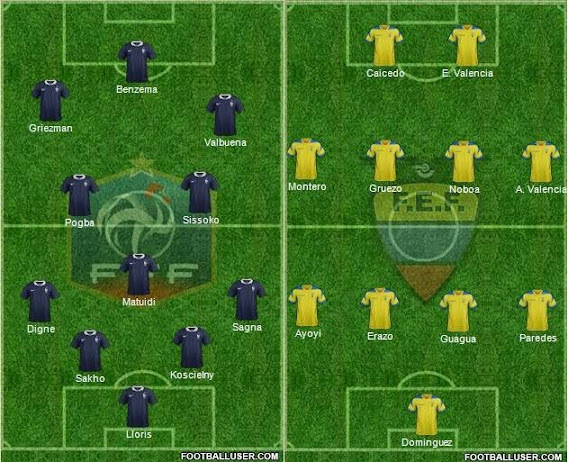 This is the just 2nd time France and Ecuador are meeting on international stage and first time in world cup history. France has a wonderful record against South American sides, as they are unbeaten in 6 previous world cup encounters with south american outfits. Karim Benzema is in hot form and he is not only scoring but also creating goals, he has a hand in 5 of the 8 goals France has scored so far in the world cup, scoring three and making 2 assists. French Midfielder Mathieu Valbuena is the key player for France and he has created 6 goal scoring chances for france in the opening two games. Ecuador striker Enner Valencia is in great goal scoring from having scored in 6 consecutive games. Yohan Cabaye is suspended for france while Laurent Koscielny might replace Mamadou Sakho in central defence as Sakho is in fitness doubt. While I expect Ecuador to make only 1 change with Carlos Gruezo coming in for Oswaldo Minda. France has played superbly in the first two games and they are considered as dark horses for the competition as other big teams have already knocked out. Confidence is flowing all around for France and I expect them to win this game with another staller performance. Its 2-1 France for me.